I’m one of those who did quite enjoy The Last Jedi, so I’m not about to launch into some kind of, “finally, we’re back on track” diatribes. If I’m honest, there isn’t really a great deal to go on here, it’s your classic teaser trailer, where there’s some bland scene making up the most part, then a series of cuts with almost single-shot action that, by itself, doesn’t really mean much. The ending of it looks quite interesting though – is that Endor? Is that the remains of the second Death Star? Hm. I’m really hoping that the Palpatine laugh at the end is either misdirection entirely, or else there’s some remnant of his spirit haunting the wreckage that Rey and co will have to confront. Also, how good is it that the band is back together here? The new big three are reunited for their trip, and it’s quite nice to have them all in the same place – much like we had with Return to the Jedi, and the old big three starting off their adventure together! Lando’s back, and he’s looking glorious! Billy Dee is definitely a welcome return, I just wish he’d been brough out of retirement sooner, really! But he’s here now, and I can’t wait to see just how he reunites with the Rebellion. It was also really nice to see General Leia is still here – I know there had been the reports of using unused footage from the previous two films to make up Carrie Fisher’s contribution to the movie, but there was a part of me that still thought she might be relegated to a bit-player. Hopefully they’ve got enough footage that they can make her into at least the presence she deserves, and if she has to go out in a blaze of glory, then so be it. Overall, I’m quite excited! I just hope Palpatine isn’t brought back as an effective replacement for Snoke, as it would make the whole Vader arc in the original trilogy pretty meaningless if Anakin hadn’t managed to destroy the Sith and bring balance, etc. Unless that prophecy is going to come back and feature in some way? I can’t really see it, as there has been a bit of a trend to almost deny the prequels exist, or certainly to ignore the material of that time. The only thing that bothers me, if I’m honest, is the title. 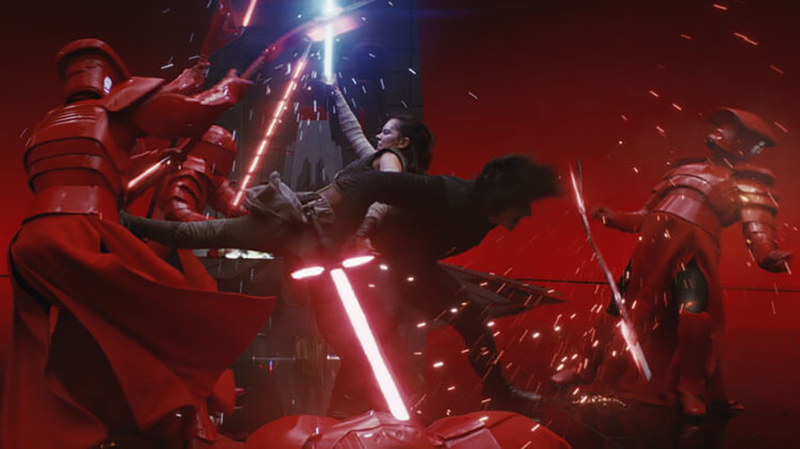 The Rise of Skywalker – while I’m not about to conjecture that it’s Rey, or Kylo’s redemption, or anything, I am a bit disappointed with it. I’m sure I’ll get used to it – I have a feeling I didn’t like The Force Awakens when I first heard it, but even so, I have the feeling that JJ is going to try and give us something I’m not sure I want at this point. Time will tell, I guess, and in a little over 8 months’ time, we’ll get to find out! I’ll have a two month old baby at that point, so hopefully we can find childcare to make it to the cinema for opening day!! Oh my word, have you guys seen this?! I have been in a bit of a Star Wars flunk lately, after having been burned by mediocre (or less) Star Wars novels and comics coming out from Disney. Don’t get me wrong, I’ve been enjoying the new films, it just feels a bit like everything else on offer has been just stale, somehow, and uninteresting at best. 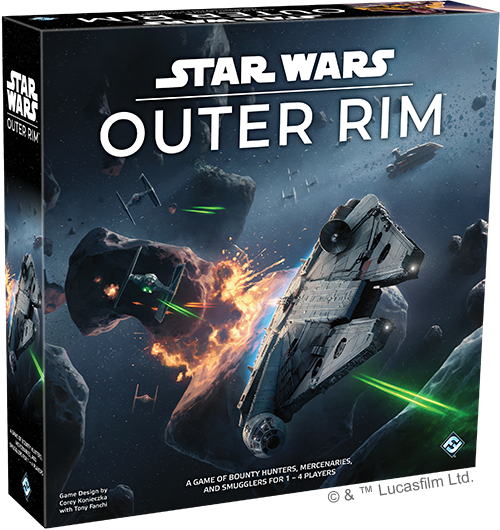 Well, I think I’ve just stumbled across the thing that will get me back among the stars, with the announcement of Star Wars: Outer Rim, from Fantasy Flight Games! It’s not a co-op game, but looks like it can be played solo, which is always an interesting point for me these days. There’s no mention in the article of any kind of AI or beating a game engine, but rather just trying to become the best scoundrel in the galaxy. Of course, I imagine there would be some kind of way to make it enjoyable solo, though I do feel it might end up a bit like playing a deck-building game without any opponents. Certainly sounds like a fun time with more players, as you each race across the galaxy trying to gain influence and the like! Sounds a bit like the much-vaunted Firefly game, which I’ve never played but hear pretty much nothing but good things about! It looks like an encounter-based system that should be a lot of fun, and being designed by Corey Konieczka – the man behind Eldritch Horror and Rune Age among others – I have high hopes that it will be an immersive experience as well. My love of Star Wars has been on a definite decline recently, though, so I’m really glad there has been something like this come along to kick-start it once again. The upcoming release of the ninth installment of the main Saga hasn’t even got me this interested, though I think this has a lot to do with internet-fatigue. You know, I kinda liked how different The Last Jedi was from all the other movies, in the same way that I’ve come to appreciate the Prequels more and more for being different to the Original Trilogy. The Sequel Trilogy (are we calling it that, now?) has been markedly different, for me, and while there have been some hiccups for me along the way, nevertheless I think they’re telling an interesting story in their own way. If all of my frustrations with these sequels could be boiled down to one thing, it would be that we still haven’t really yet gone wider in the universe. I guess that’s my own problem, because the OT wasn’t particularly wide, but the EU we had for years did a very good job of filling the rest in, so it still felt like a whole universe. I suppose once we’ve had all of the plot holes filled in with Episode IX, we’ll hopefully get some novels that can go back and tell us more about Snoke, the First Order, how the Rebellion became the New Republic which became the Resistance (though I believe that is starting already). I suppose I just need to try and give it some more time. I started to read Last Shot back in July last year, and had to give it up as a bad job roughly halfway through. I read a few more books, got married, and then came back to finish it in, I think, October – mainly because I hate to leave a book unfinished, even if it’s a bad book. And this, in my opinion, was a bad book. It suffered, for me, from having an author who seems determined to only use the movies as reference material, and begins to incorporate all manner of ridiculous, annoying things in here, because he doesn’t know anything else. The Ewok slicer just got on my nerves, and the Gungan prison warden in Kessel made me want to punch the book multiple times. I mean, there was just so much wrong about this book that it just annoyed me to pick it up and try to read it. I’m not going to attempt to do a full review of it on my blog, because I’ve been trying to cast all memory of it from my mind, but suffice it to say, I did not enjoy this one, and as it happens, I’ve been pretty much away from Star Wars since. I suppose it’s just part of this burn-out, where I’ve still not really read an enjoyable SW novel since the excellent Bloodline, and the comics are so bad I’ve actually stopped buying them month after month, as I’ve only marginally found one or two interesting, at best. I’ll probably do another catch up with them at some point, but otherwise, I’ve just been feeling decidedly unimpressed with the new stuff. In all honesty, I don’t think this has got a lot to do with my nostalgia for the old EU, either, as there was plenty there that was, shall we say, less than inspiring? But it’s a shame, because I think there has been some good stuff to come out since the Disney take-over, and for me, one of these has actually been the Solo movie. I’ve been quite disappointed with the internet reaction to this, as while there were some odd things, and some unnecessary things, overall I thought it was actually a good movie, and definitely worth its place in the movie-verse. Details seem to be pretty scant as to what new movies we can expect from Disney post-episode 9, which I find to be quite curious. 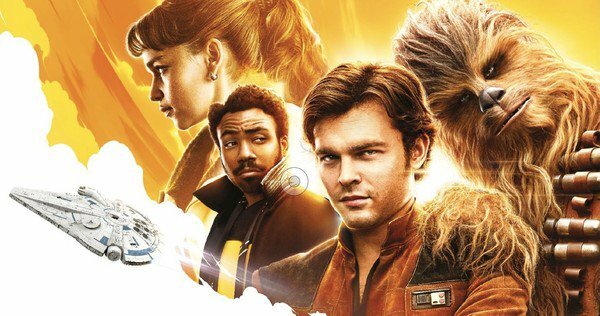 Solo was, apparently, the most expensive Star Wars movie ever made, and that it failed to make that back at the box office seems to have put the nail in the coffin – or at least, the brakes on – any further movies being developed. Maybe they’re just waiting to see how well IX does before they announce anything further? At any rate, while I’ve not been enjoying the new films anywhere near as much as I enjoyed a movie with Lucas at the helm, I’ve still been finding a lot to enjoy in these new offerings, and I think I’m over that initial fear of Star Wars-saturation. It’s been a long slog since The Force Awakens started us on this road, but I’m hopeful that, once we’re out of the communications blackout that always seems to surround making an “episode” movie, we’ll have a lot more to look forward to. And, y’know, I hope they finally go wide and let some really talented and imaginative authors explore this new universe and finally flesh it out for the fans! I’ve been rambling a lot in my recent blogs about Warhammer stuff, but it’s time for a change of scenery today as I switch over to my other obsession, Star Wars, and the Tim Zahn duology from 1997-8, The Hand of Thrawn! 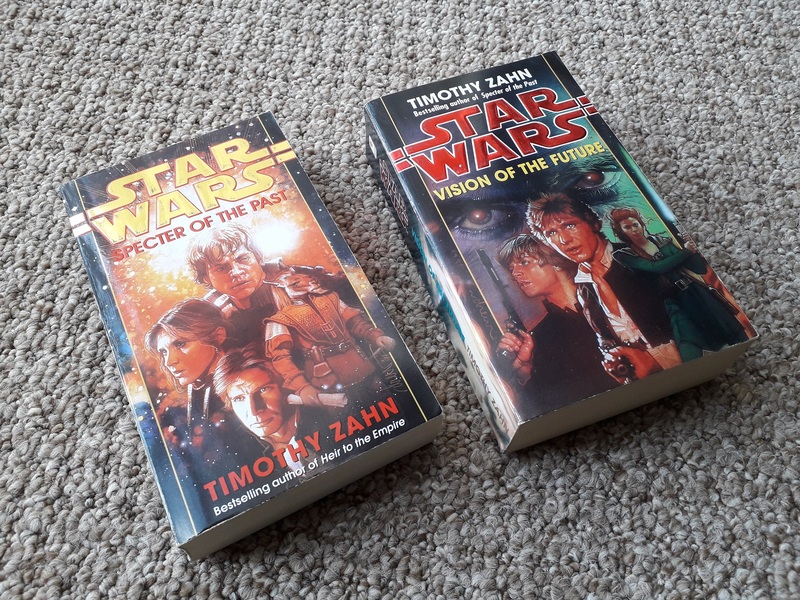 I first read these novels years ago now, completely out of sequence as I had just finished Zahn’s seminal trilogy, the Thrawn Trilogy, and was hungry for more! It was the summer after my GCSE exams had been finished, and I was free to read whatever I wanted, rather than trying to catch chapters of The Last Command in between revising physics, or whatever. Specter of the Past begins with the discovery of a badly damaged copy of The Caamas Document – a datacard that details the Bothan saboteurs involved in the destruction of the planet Caamas long before the Clone Wars. The planet’s inhabitants, the Caamasi, were well-known peacekeepers and valued mediators, and the destruction of their world was cause for galactic outcry back in the day. The discovery that there were Bothans involved leads the New Republic almost to civil war, as several species come down either on the side of wanting to make the Bothans pay for their crime, or else on the side of those who believe a more peaceful solution is needed. Of course, plenty of folks are just using the discovery of the document to reignite old hatreds and resume petty conflicts that the Empire had pretty much put on hold. While Leia attempts to keep the New Republic from fracturing too much, Luke is off trying to discover who is backing the Cavrilhu Pirates into attacking New Republic shipping, with what he believes to be clone pilots. His investigation almost leads to his death at their asteroid base, but Mara Jade manages to rescue him and, as they’re leaving the system, they notice an odd type of TIE-fighter lurking in the asteroid field. Turns out, the renegade Imperial Moff Disra has been using the Pirates as part of his plan to restore the Empire to greatness, a plan that involves resurrecting Grand Admiral Thrawn through the use of the con artist known as Flim, and the tactical acumen of a Major Tierce, former Imperial Guardsman to the Emperor. He sets a plan in motion to cause said civil war above Bothawui, using elements from Imperial Intelligence to forment riots and general dissension over the Caamas issue, leading our heroes to try and find an intact copy of the Caamas Document, and name those Bothans responsible for destroying the shield generator, rather than holding the entire species accountable. This is the background, and the duology takes us through the sort of galaxy-spanning epic that we expect from Zahn in his Bantam era. It really has that sort of feel that we know from the earlier trilogy – our heroes flying across the galaxy, visiting planets we have never heard of and encountering a whole load of weird aliens along the way. While Admiral Pellaeon is trying to sue for peace with the New Republic, Disra’s plans lead to a more subtle conflict with the Empire at first, which is a different change of pace for pretty much any Bantam novel. There is a lot of the shadow war with Imperial Intelligence, and while Flim’s Thrawn impersonation is seemingly flawless, he is nevertheless kept almost hidden from view, with merely the rumour of his return being cause enough to send the New Republic into a frenzy. The civil war is balanced along a knife edge that almost runs on too long, but is nevertheless built up really very well. One of my earliest gripes with this novel was the fact that Zahn seemingly felt the need to bring Thrawn back from the dead. Of course, the book is pretty much from the off about a con game and we know it, but it did feel a bit like he couldn’t think up a more convincing villain for the heroes to go up against, so he just brought the earlier one back. Of course, when you get to the end of the book, and reflect on the story as a whole, it actually works really well. We get to meet Thrawn’s people, the Chiss, and learn that Thrawn had in fact set up a clone of himself to return to known space ten years after his death, should that come to pass. Irony of ironies, it’s been ten years and now Disra puts his plan into action. The Chiss almost enter the war on the side of the Imperial Remnant, but by the end of Vision of the Future, it appears that they’re content instead to sit this one out, keeping their focus on the myriad threats of the Unknown Regions. Naturally, given when this duology was published, Zahn has got a lot more Star Wars lore to pull from this time around, rather than having to make the whole lot up for himself, and there are a lot of references to Mike Stackpole’s work, particularly the Rogue Squadron comics. Baron Fel makes an appearance, and Corran Horn is something of a major second-tier character. Zahn and Stackpole are friends, of course, so that isn’t unexpected, but it does feel weird that we get that sort of detail this time around. There is also reference made to both the Black Fleet Crisis books and the Callista trilogy, though these do feel a little forced at times. In the midst of all the chaos, we of course get to catch up with Talon Karrde and his organisation, and get to see a lot of the smuggler chief’s history. It was interesting to see this sort of thing expanded upon, and we get a lot of links back to The Thrawn Trilogy and some of the plot points that were left hanging from that series are wrapped up. Notably, Mara Jade leaves the Karrde organisation at the end of the duology, although Karrde has already had an almost-replacement for her in the form of Shada D’ukal, the Mistryl Shadow Warrior from The Last Command. There is a lot of weaving of threads from earlier Zahn stories throughout the pair of books here, but I suppose Shada shows how far this goes when we get an almost synopsis of the short story Hammertong that Zahn wrote for Tales from the Mos Eisley Cantina. I wouldn’t say the references are particularly necessary to enjoy the books – I certainly did enjoy them when I first read them back in the day, having only previously read Zahn’s trilogy and Crimson Empire up to that point. But there is another layer that can be enjoyed if you have indeed read through the myriad offerings of short stories in this way. Don’t get me wrong, of course – it’s not all sunshine and rainbows. Far from it, I was actually surprised to discover that I didn’t rate this duology nearly as highly as I remembered. I think a lot of that is down to the fact that I have such fond memories of reading these books as a sixteen year old, that now I’ve come to expect more from my literature in general, I found them to be a bit lacking. There is quite an effort made, I feel, to recapture the spirit of the Thrawn Trilogy, almost to the point where it becomes annoying, and I find myself wishing that Zahn had branched out into a completely new direction. Elements of the storyline such as Karrde’s plot were a lot more refreshing, because they had the hint of the earlier trilogy without rehashing it as much as, say, the Luke and Mara trek through the caverns of Nirauan – which Luke actually explicitly compares with their trek through the forest on Myrkr. There are also some vaguely silly scenes, particularly around the Caamas Incident politics. It’s nice that we get reference to the senate being rebuilt following the Almanian Uprising, that does help to make the universe feel really coherent, but the fact that the senate is populated by weird senators, one of whom is jabbering on about needing to sit on her eggs, just feels too out there. Weird. There were also a lot of elements that felt a lot more like fan fiction than perhaps they should have been. I probably need to elaborate a lot more on this, so here goes. Any movie tie-in like this can of course fall under the heading of fan-fiction, as that’s basically what it is. However, for official licensed media by Lucasfilm, novels like these should feel more like a continuation of the storyline, and while new characters of course need to be introduced to keep the narrative fresh, the way that new characters interact with movie ones is usually where these things fall down. During the Thrawn Trilogy, the interaction was superb, and it felt like these people truly inhabited the same universe as the movies. But when you get a character (or characters) being made into something “better” than the movie heroes, the whole situation can quickly devolve, and it feels a lot like that happens in the scenes where Mara is berating Luke for his actions over the last few years. I know why it was included, of course, as the Bantam novels did have a tendency to make Luke into a kind of demigod at times, but it smacks of something I particularly dislike from Stackpole’s novel I, Jedi, where Corran tells Luke off in such a manner that makes Corran out to be a much better person – maybe even a better Jedi – than Luke is. It makes me cringe so much, and unfortunately that does happen a couple of times in the course of Vision of the Future. It feels very much like Zahn is trying to re-set the narrative by taking Luke away from the god-like portrayal of other novels, and instead set him up for the next stage (which may or may not have involved fighting the unnamed threats of the Unknown Regions), but has the end result of almost returning him to the sort of farmboy he was in A New Hope. That was a bit rambly, but hopefully you can follow my point! There is still a tremendous amount to enjoy from these books, and I can definitely recommend you getting a hold of them if you can and giving them a read. While they pretty much have no bearing on the Star Wars narrative post-Disney, of course, they’re nevertheless some of the better books to come out of the Legends canon, and are still some of my favourites! I went to see the new Star Wars movie on Thursday night, Solo, and I have to say, it was pretty damn good! There will be extensive spoilers throughout this post, so don’t say I didn’t warn you!! The film follows Han during his early years prior to the events of A New Hope, and I was actually surprised by how much of the existing back story for him has been kept. He starts out as a street kid on Corellia, mixed up with the crime lords there, and attempts to flee for a better life with his girlfriend, Qi’ra, but the two are separated while escaping. Han joins the Imperial Academy in an effort to gain the money to come back and rescue her, but three years later, he has washed out of the Navy and is part of the Infantry on a hellish action on Mimban. There, he comes across the smuggler Tobias Beckett and his gang, posing as Imperial soldiers. For insubordination, Han is thrown into a cell with “the beast”, a Wookiee named Chewbacca and, due to his ability to speak Shyriiwook, Han manages to break out, and they both escape to join Beckett. Beckett’s gang is on a heist to steal the hyperfuel coaxium on the planet Vandor, a job that goes sour when the Cloud Riders pirate gang then try to steal the shipment. Beckett and the others get away, but the job was taken on for Dryden Vos, head of the Crimson Dawn crime syndicate. Vos is not happy, but Han and Chewie go along with him to try to retain favour and offer to steal another shipment that will replace the refined fuel from Vandor. Han explains there is some unrefined fuel held in a vault under the spice mines on Kessel, so the gang head off to steal it. Han also discovers that Qi’ra is now working for Vos, and she is sent to keep an eye on them during the job. In order to get a ship fast enough that will get the coaxium to a refinery before it degrades, Qi’ra introduces the gang to Lando Calrissian, a retired smuggler who owns the Millennium Falcon, said to be the fastest ship in the business. Han attempts to win the ship in a game of sabacc, but he loses – however, for a cut of the profits, Beckett persuades Lando to join the crew. The gang then heads off to Kessel and stages a prison break out to cover the theft of the coaxium, however an Imperial patrol shows up as the smugglers are about to make it out. Han manages to out-fly the Imperials, and the group makes it to an old refinery on the planet Savareen. There, the Cloud Riders show up to steal the fuel just as Dryden Vos appears to collect it. They learn that the Cloud Riders are a nomad group attempting to rebel against the tyranny of the Empire, and need the fuel to continue their raids. Han comes up with a plan whereby they can help the Riders, but Beckett doesn’t want to fall foul of Dryden again and walks away, saying he has heard of a gangster on Tatooine and offers Han the chance to join him if he makes it out alive. Han then gives Dryden the coaxium, but Dryden has been told of Han’s double cross by his inside man, who is revealed to be none other than Beckett. Dryden’s men are sent to collect the real coaxium from the Cloud Riders, however, Han has triple-crossed everyone by presenting the real coaxium to Dryden, and giving the Riders nothing. The plan works to lure out all of Dryden’s men, however, and Beckett attempts to steal the fuel, leaving Han and Qi’ra alone with Dryden. Qi’ra, who has been taught Teräs Käsi, manages to kill Dryden, and tells Han to go collect the fuel from Beckett, whereupon she’ll join him. However, Qi’ra sends a message to Dryden’s boss – none other than Darth Maul! – telling him that Dryden is dead and she has now assumed command of the Crimson Dawn. Han recovers the coaxium with Chewie, killing his mentor Beckett in the process, but is dismayed to see Qi’ra leave in Dryden’s ship. It was really nice to see Kessel in the film, and interesting how much of that lore has been retained in so far as the deadly approach and the Maw are still a thing. 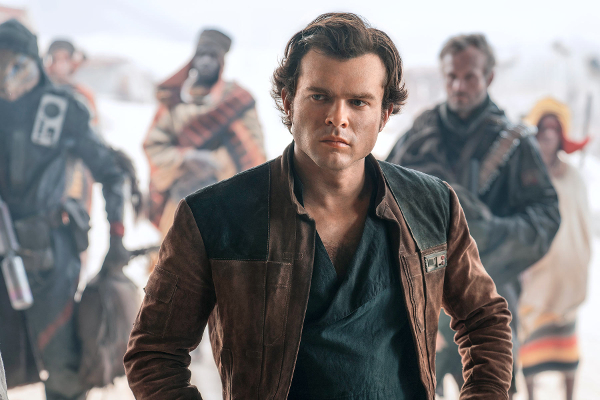 Alden Ehrenreich is signed up for two more films, which makes a lot of sense as, while the film was really good, I thought it definitely set up at least another story, but if the quality can be maintained, then a Solo trilogy could be a wonderful thing. Much more than Luke or Leia, Han Solo at this point in the timeline can be such a vehicle for seeing the wider galaxy, but the seedier side of it as well. We could get to visit the Corporate Sector, which we know to be a thing in the new canon thanks to Catalyst, among others. But I think we need to see how Han came to be under the thumb of Jabba the Hutt, and we need to see more of Han and Lando beyond this one adventure. Lando is the guy Han turns to when he’s in a jam, but I didn’t get that from their relationship here. While Rogue One was fine on its own, I think a Solo sequel would be great. The references to the wider expanded universe were off the charts with this one, and I absolutely loved it! 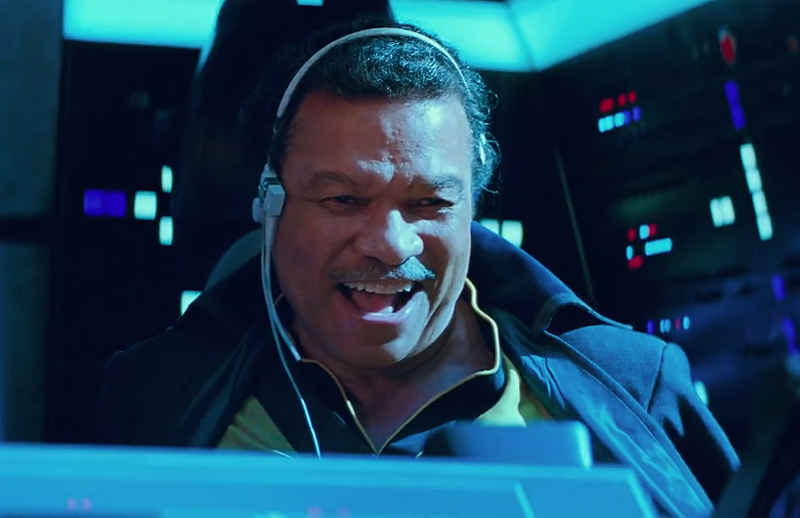 Lando makes at least two references to the godawful L Neil Smith trilogy from the early 80s, which was actually really fun; however, for the main part we get a lot of really nice throw-away lines that help to really fix the place of this film in the wider Star Wars lore. While you could argue against calling on the same small pool of names when you’re dealing with a galactic wide cast, mentioning Bossk as a potential hire for Beckett’s gang was a cool touch. We also learn that Beckett killed Aurra Sing, at which point I had a huge grin on my face! I really want to know why Maul is now head of the Crimson Dawn. I should probably catch up with the Clone Wars cartoon series, not to mention Rebels, in case we can learn anything there! It was good to know that he was played by Ray Park once again, and while Peter Serafinowicz doesn’t return this time, we do get Sam Witwer, who played Vader’s Secret Apprentice for The Force Unleashed back in the day. The Cloud Riders are an interesting bunch, and I think I’d like to see more of those guys – while it’s always a bit worrying seeing the amount of pre-Alliance rebel groups hanging about in the galaxy, the fact that Benthic from Saw Gerrera’s Partisans is a part of the group was a nice touch, and serves to help pull these people together I think. I think it’s an interesting point here that both of the stand-alone movies released by Disney so far have been instant hits for me, while the episode movies are a lot slower to burn. I’m still a little undecided about The Last Jedi, while I didn’t even need to wait until the credits to know that I liked Solo a whole lot more! I suppose it has something to do with Disney tapping into the original trilogy era, and the sense of nostalgia we all have for those movies, by creating a universe that draws on that same style. It’s a lot more difficult, I suppose, when you’ve got the task of creating something that must move away from that look by definition of the fact it takes place decades later. There’s probably more to be said on that topic, but this blog is already running quite long already, so I think it’s time to stop for now. If you haven’t booked your tickets already, definitely go check this movie out! If you’ve read through this entire post to get here, you probably don’t need to go see it for yourself of course, but it’s definitely an enjoyable movie! It’s May 4th, so it’s now compulsory to write about Star Wars! I recently watched The Last Jedi for the second time (I know, it’s shocking), having picked up the DVD upon release. When I first saw it back in December, I felt like there was a lot going on, and the film does still feel quite busy in that respect. There feels like a lot of chaff included, and the Battle of Crait at the end did feel a little… not a let-down per se, but it certainly didn’t feel like the climax the film had been building to. I guess we have a few mini-climaxes throughout the film, such as Rey vs Kylo Ren. When I watched The Force Awakens for the second time, it somehow felt a lot more like a Star Wars movie than when I’d watched it in the cinema. With The Last Jedi, however, I’m still in that middle ground of kinda liking it, but it still feels really weird and different to everything that went before it. I mentioned earlier that there is a lot of chaff in the film, and I think this primarily surrounds the Resistance storyline, as they’re chased through hyperspace. 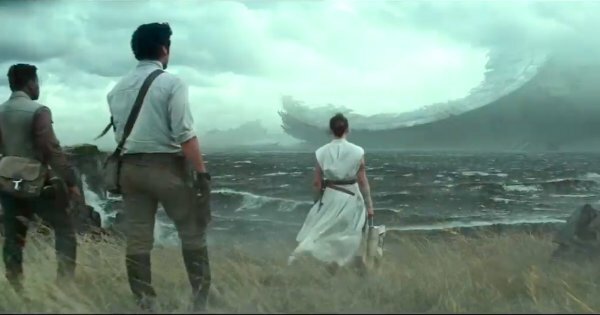 There is definitely an attempt to build a lot of tension for this whole arc, but it just feels robbed of that when Finn and Rose head off to Canto Bight. And that whole gratuitous cameo of Maz… I really like her character, I just wish she could either come back in a better way, or else be left out altogether. It just made no real sense for Poe to know her, somehow. 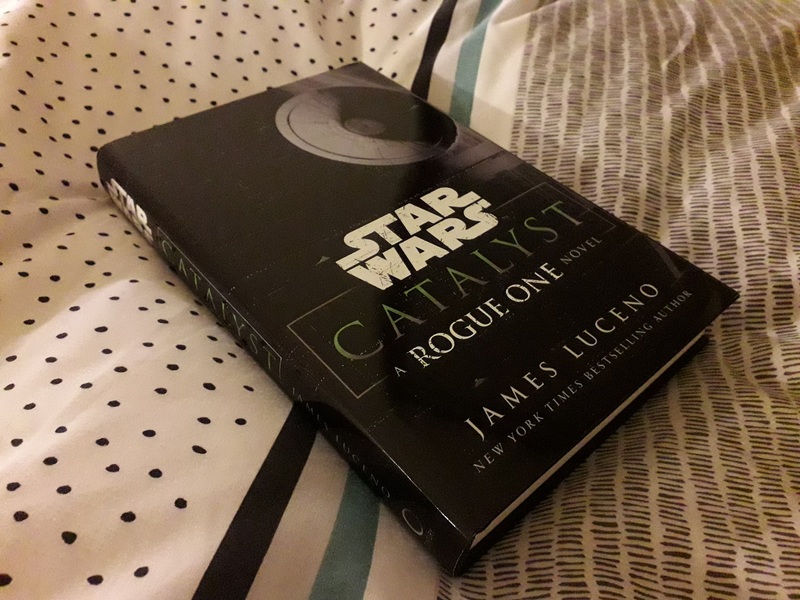 The novel begins while the Clone Wars are still in full-flow, though Galen is notably undertaking research far from the front line, attempting to synthesize kyber crystals to create a renewable energy source. He is soon wrapped up in the fight between the Republic and the Separatists, however, and it is Krennic who comes to his rescue. Over time, Krennic manages to seduce him into working indirectly on the Death Star project, as Galen researches the energy output of the crystals that is then weaponised by a separate team of scientists. During this time, we do get to see the fascinating upheaval from Republic to Empire, which is something that I enjoyed. It’s interesting how quickly people seem to forget the Jedi – I’d always liked the alternative idea that is often hinted at within the Dark Times comics, that the idea of the Jedi carried with it such inherent danger that people chose not to involve themselves. Anyway! Another strand to Krennic’s ambition is his use of the smuggler, Has Obit. Has is used to basically deposit weapons on the so-called Legacy Worlds – worlds that are the Star Wars equivalents of National Parks. With this, Krennic is able to claim the worlds were arming themselves against the Empire, and so their Legacy status is stripped from them – and the strip-mining of all natural resources can begin. Over time, Has sees what he is doing and, thanks to Galen’s wife Lyra, turns against Krennic and helps the Ersos escape Coruscant for good. There’s more to it than that, of course, but the basic gist of the story is here. So what’s so bad about it? Well, first of all, Galen Erso has got to be one of the most infuriating characters ever to grace the pages of a Star Wars novel. He just annoyed me so much, I found myself wishing his bits were over so that we could get back to Krennic, who is actually quite interesting, for all his naked ambition. While the book is a really nice marriage of the Prequel era and the Original Trilogy era, these ties are somehow relegated to the background in comparison with other Luceno novels. There was a nice sequence with Krennic and Poggle the Lesser, as he tries to get the Geonosians to construct the focusing dish for the battle station. Also, Krennic’s patron throughout the book is Mas Amedda, who comes across as slightly more competent in this book than, say, his Aftermath appearances. Tarkin also has a significant role, though he serves more as an obstacle to Krennic than anything – he doesn’t quite come across the same as he does in, say, Luceno’s Tarkin. Which is a bit weird, as they’re by the same author, but I think herein lies the main gripe I have with the book: it feels a bit rushed. I can’t quite decide if I mean it feels like it was pushed out to meet a deadline, but the action sometimes feels entirely too glossed-over. True, a battle station the size of the Death Star is going to take years to build, which could be tedious if we had to have all of that detailed to us, but there were several instances where I felt we could have done with more detail. Whether all new canon novels need to conform to a certain page length, who knows, but I definitely felt like we could have benefited from a bit more. So, while I did feel a bit let-down overall, there were still some good bits to be enjoyed. Mentions of the Corporate Sector and COMPNOR were particularly nice, as it’s always fun to see the old canon being referenced. And the way the novel straddles the Prequel and OT eras was nicely done, too. While the Jedi stuff could have done with more time spent on exploring how they just dropped out of the galactic consciousness, I guess this book isn’t trying to tell that particular tale. I don’t think it really adds anything to Rogue One, save perhaps explaining Saw Gerrera’s relationship to the Ersos (which itself seemed a bit forced). Which brings me on to my final point – why can’t we have Star Wars novels for their own sake anymore? It feels like everything that has come out so far has been trying to tie into something, either a new movie or an appearance by a beloved character in a cartoon. Why can’t we just have a book for its own sake? Heir to the Jedi springs to mind as perhaps the only one, so far, and that was originally planned as the third in a loose trilogy prior to the abolition of the old EU. I’d love to have something that tells its own story, that can run to 500 pages or more, and just brings back some of the old Bantam magic. We still don’t really have that feel right now, I think, where the galaxy feels like a cohesive whole. Where’s the new canon’s Mara Jade, or Talon Karrde? The novels feel like they exist in some kind of weird vacuum, and I’m really not sure that I like it. Sure, plenty of them are good, but they’re good by themselves, with no real reference to the wider galaxy. The hipster in me is thinking, this is what happens when a franchise hits the big time, and everything has to have a mass-appeal. Whereas previously we could have novels that reference comic books, which reference other comic books, which reference other novels, which reference RPG material. There was an expectation that people reading these things would be immersed to the next level at least. Now everything seems to need only the films – the widest audience for this material – to rely upon. It’s just feeling kinda fractured, and I’m not sure how much longer I can keep myself interested in this way of doing Star Wars. Yes, that’s right folks, there’s all manner of cool new Star Wars stuff coming at us right now! While there’s a part of me that still feels a little like it might be too much new Star Wars stuff, I’m still excited as all hell to see this stuff, so let’s jump right in! Well, the teaser is now out, and I am enraptured! Oddly, I didn’t think much of Rogue One from its trailers, yet have come to really enjoy that film, so maybe the same will be true here, as well! 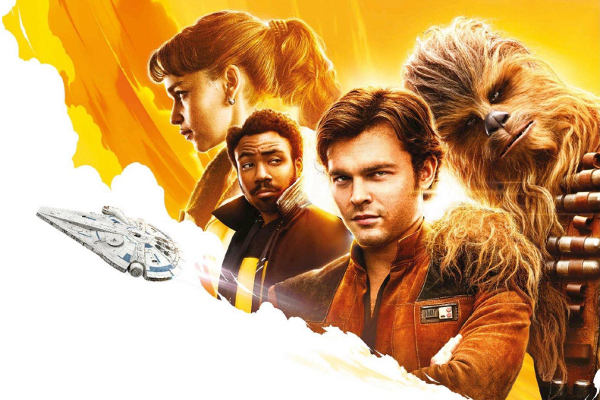 The cast looks great – I don’t actually mind Alden Ehrenreich as the young Han Solo, it looks like he’s going to be making the role his own rather than trying too much for a young Ford impression, and Donald Glover as Lando Calrissian could be amazing! I think a lot of my initial warmth comes from the fact that it looks like a lot of the established lore of the character has been preserved. Han was always a washed-out Imperial pilot-turned-petty-criminal, and it seems this is going to follow that premise but with its own spin on things. That looks to be very cool. What I like the most, though, is that we seem to be promised a look at the more ordinary lives of folk within the Empire. Sure, Luke’s life on Tatooine might be said to provide that already, but we’re mainly concerned with events of galactic import in both A New Hope and Rogue One. If Solo pans out as I think it will, we’re looking more at a film with the possibility of showing us a lot more of the regular galaxy during this time, and that is a very exciting thought, I have to say! Solo is out on 25 May, and I’m already counting down the days! Disney have confirmed that a couple of TV shows are in the works, with some theories that at least one will be replacing the Rebels cartoon with another animated show. We’ve been promised a live-action TV series since before Revenge of the Sith, of course, so it would be cool to finally see something come from that kernel, too. I’m not a huge TV watcher, but it does strike me that people are doing fantastic things with the small screen these days, so I guess it could finally be the right time for something amazing to come along! We’re also getting a new series of movies that are separate from the episode films, and from the new trilogy being worked on by Rian Johnson that was recently announced. This new series will be created by David Benioff and DB Weiss, the creators of the Game of Thrones TV series, though hopefully with a little less violence… The series will reportedly be spun from “a point in time in Star Wars mythology”, which rather makes it sound like a series of anthology films in the vein of Rogue One. Could it be the Old Republic? Who knows. I’m finding myself a big fan of these anthology films, and I’m really stoked for Rian Johnson’s trilogy, but to have yet another series of films feels a bit like Star Wars overload once again. I’ve talked about this before, of course, but a new Star Wars movie used to be An Event, with fans waiting years while gathering the hints and clues. Now it’s just, “oh yeah, there’s another Star Wars film coming out…” For sure, the Marvel Cinematic Universe has proven to be a huge success, but even that vast juggernaut is not without its flaws, especially the longer it has gone on. Are we going to see the same with Star Wars? A series of formulaic movies that are created solely to create more money? It’s arguable that the original three only existed to create money, but I rather liked the fact that George Lucas’ six movies actually felt complete in and of themselves, and while the story of that universe had been expanded through novels and comics, the films themselves were basically self-contained. Now, we have the potential for an expanded universe situation to exist in movie form, where my shelf of DVDs (or whatever medium we’re using then) in twenty years’ time is full of throwaway movies of varying interest and significance. I feel a bit uneasy with how my beloved Star Wars is being pumped for every last dollar that it’s worth, though ultimately I guess it doesn’t really matter if these movies are all beautiful and fantastic! But what does everybody else think? Are we in danger of over-saturation? Or is it just a glorious time to be a Star Wars fan? Let me know in the comments! Author spalanzPosted on February 8, 2018 February 8, 2018 Categories Star WarsTags Han Solo, new canon, news, Solo, Star WarsLeave a comment on New Star Wars stuff!